Though no longer in elementary school, I still get a kick out of paper snowflakes. I made this snowflake garland the other night from origami paper, dental floss, and tape. The second and third flakes in this garland are based on a 5-pointed star. Download the 5-point folding directions right here. I think they're easier to cut since there are fewer paper layers. The first, fourth, and fifth flakes in the garland are based on 8 points. (Fold a square in half diagonally and keep halving it until it's nearly too thick to cut, then snip out small shapes ). Here's an 8-pointer. Unfolding is my favorite part; it's practically as thrilling as bungee jumping. 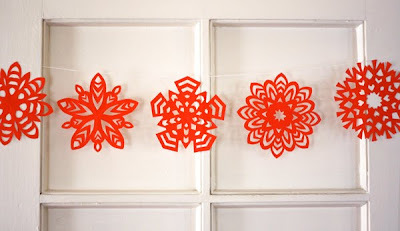 To get them nice and flat, iron your snowflakes with the steam setting turned off. 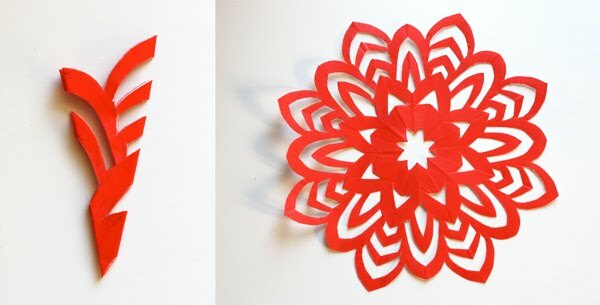 I always cut six-pointed paper snowflakes, because they're scientifically accurate. It's nerdy of me, but they make me happy. Okay, I'm trying it out and having some trouble with the directions. Am I supposed to flip the paper over to the other side around step 6? Ahh... I just wrote a post about 8 point flakes. Then wrote another cuz I was corrected by my momther. I love thes 5 pointers! Nevermind, I figured it out! Gorgeous! Liz, no flipping the thing over. In step 6, grab the left corner and bring it over so you're folding on that dotted line. What used to be your bottom edge should now line up with the edge on the right. Ah! You got it while I was typing. Good job. Other Liz: fabulous. You've covered 6. Okay, who wants to figure out how to do 7? Um, not me. When did you go bungee jumping?!?!!!!! Is that package for me??? It's easier to fold than a 6 point BUT way harder to cut into. Just did it! Patting myself on the back! Now going to make GIATNT ones for my daughter's "Penguin Snow Party" next week! Thanks so much! You brat- you make my snowflakes look sad...lol. I can't wait to try this. Thanks for the instructions! I just made three of them with white paper and taped them onto my big window! Thank you! Thanks for sharing these fabulous snowflakes! It''l be a perfect addition to my holiday decor. Love your site BTW! Hmmm...I'm going to give it a try!! I made some of these following a tutorial on YouTube. They were so much fun to make! i always make white ones, i never thought of making orange ones!!! exciting!!!! Love it! I am doing a Virtual Advent calendar and yesterday's action was to cut snowflakes - I linked to you today. These are beautiful! Thanks for the tip on pressing them and the gift wrapping idea. Wow, the red paper is genius! Thanks for the great photos and clear instruction. I'm going to give these a try for sure! How much I love vibrant Orange!!! LOVE the orange, would have never thought of using a bright color like that! I've been cutting these out for packages too! But, yes, I am a strict 6-pointer as well. Though 5 points would make lovely stars! this. is amazing. love it. also loving the scientifically accurate comments haha so fun! three cheers for science! I thought you might enjoy the quote. :) CUTE snowflake, by the way!! Nice! I make them with white paper almost every year for x-mas. Tip: As a finishing touch I iron them first and then dip them in a pan with melted candle wax. Makes them very stirdy and long-lasting. I ♥ making the kids do this. Beautiful post! One of my readers led me over here after pleading for help in my post today...wish I'd seen this tutorial before making the worst looking felt snowflake placemats ever! These are gorgeous...and now I'm hooked on your blog! Ellen, I used this stuff. I also have some bigger sheets I use sometimes. I am totally wrapping my presents with these! I was looking for something special to add and as always, your blog has the perfect touch! Thank you! these RED snowflakes are just adorable! i honestly couldn't even remember how to make a snowflake anymore....so i had to youtube for instructions. and....i'm finding there is an "art" to making the BEAUTIFUL ones that i see here! I made a bunch of snowflakes yesterday, which I'm now gathering up to throw away because they look so pathetic compared to your gorgeousness!!!! Thanks for the tutorial!!!! I love paper snowflakes. i make tons every year! J, the PDF page has only the folding instructions, nothing else. It's letter sized for printing. When you've clicked the link and the PDF appears in your browser window, right click (or on a Mac, hold down the Control button and click), and you should see an option to save the PDF on your computer. Do that. You can open it in Adobe Reader (it's free and you probably have it already) or in Preview on a Mac. Then print it. eek! I didnt even know this was possible!! SO excited right now. Thank you so much, they are great! LOL I had forgotten that I did this as a kid, so had to try! Love it! I just love your orange snowflakes. showed you post to my daughter, now she wants to make them! Those snowflakes are gorgeous! Where did you find your templates? Lovely! Thanks for sharing the instructions! How do you fold the paper to make an 8 point snowflake? I know, I should be able to figure it out, but I'm clueless. I only got the 5 point snowflake from using the instructions. I featured this idea on our blog at Materials for the Arts. These are awesome! I can't wait to make some myself! these are the most beautiful snowflakes I have ever seen, seriously! They are each so beautiful. Love this. I've never seen 5-pointed ones before. Fun! I usually do 6-sided ones and definitely find them easier to cut than the 8-sided kind. I just spent my Saturday morning making these. Each one was cuter then the previous. I think the key is ironing them when they are finished. I tried to skip this step but they were not as nice. I can't help it I am an immediate satisfaction kinda gal! Jess, Do you buy your origami paper in bulk from somewhere? And what sizes do you usually keep on hand? Thanks. You've got some super cool ideas! they are so lovely! i´ve already made a few ones and i love the 5-point-system! So pretty! I shall make some of these for my sister who is having her first xmas in her own place. Poupee, see my comment higher up in this thread for a couple links. I just have 6" and 10" sizes, and have ordered some from Amazon or picked some up here and there at art stores. Haven't bought any in bulk. 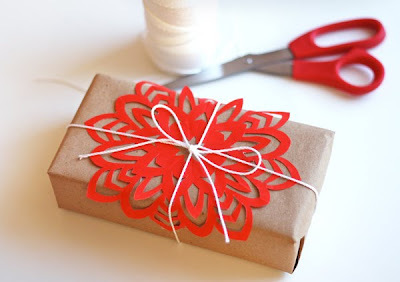 Love these as a wrapping accessory. I'm terrible at wrapping gifts but with the butcher paper and simple twine it looks so cute! I'm totally in love with this tutorial!!! I'm making just plain STARS! 5 points and perfect ;) eheheh!! Amazing! I've always wondered how to make these beauties! Thanks! Thank you SO much for posting this! I immediately made two of that 8 pointer, and then four more of my own design, which I NEVER would have known how to do without this. Thank you! I had been longing for days to make beautiful paper snowflakes! Definitely going to try this out! those are so cool! way better than the lame fat ones i always end up making...i might try your version. i'm sure it will DEF be more thrilling than skydiving. haha! Thank you! I am folding right now. Can you show us how to fold for the 8 point? I am dying to make the gorgeous one you shared here! Hi! I'm 15 and I go to an online school. My art teacher showed me your blog and I think it's really cool! I love the designs! love the orange on the packages! I love these! I've always wanted to know how to make them but could never figure it out (I must have missed that class in kindergarten). very very beautiful and nice pics of orange color. thank you so much for the instructions. you saved my decorating life, hahaha. thank you for your blog!! Thank you so much for sharing this, very beautiful! Oh my word! Those snowflakes are awesome!! thanks for the know how!! So fun! Oh, now I wish we hadn't made so many damn cranes out of the origami paper! Beautiful snowflakes! I like to do them too :) And thank's for the tip about ironing! Loved the refresher course on making five point snowflakes. So much fun. Just gave it a try and it worked great. awe, was catching up on old posts and ran across this. I've lost faith in you! snowflakes are supposed to have six points! I cut tons of paper snowflakes every year but always 6-sided because that's what we teach the kids about snow at preschool. I'm going to be making some 5-pointed ones for me, though, and using fun colors. And I'm not waiting for winter, either! Thanks! this is great! I am going to use this idea for my son's winter themed birthday party! thank you for sharing! There are going to be some nice snowflakes over here in Holland! Love these ans am going to try in felt. Thanks for sharing the 5 point star instructions. Been looking for them everywhere! Hi, the snow flakes are beautiful. I was wondering if you have some kind of templates for cutting it since your designs are so beautiful and I can't get them. I'm going paper this year - I made 7 paper ornaments last night and making snowflake garland tonight to hang on our fireplace. Thanks for the ideas and I love your blog! with a link to your site. Thanks for instructions. We made many with children. What a good afternoon we had! Now they are into my windows, it's beautifull forXmas. cool! I can use that 5 point folding technique to mark negative areas for quilting! Thanks! Hi! I love this packaging. I featured you on Fun Friday Finds today! I hope you can stop by and check it out and even grab a featured button while you are there. Ohh this is AWESOME!! I just tried it out on a piece of scrap paper and while it's not at all pretty it does show me the endless posibilities! Thanks so much for the folding directions. Do you have any for 6 and 8 pointers as well?? That last one you used for that package is beautiful! Just want to let you know that I'm featuring your red snowflake wrapped package on Dec. 4, 2012. Thank you its beautiful. I like your design on your snowflake!! The two snowflakes are wonderful!There are many snowflakes shown here, but I have found only two with instructions. Did I miss something? All the snowflakes shown are based on either 8 points or 5 points, so that's why I've only mentioned how to make those two. where do you get the paper? I ordered a pack of red origami paper at Amazon. Does anyone know how to make the red snowflake at the top of the page. I love your colorful snowflakes! Thanks for sharing!